If you are looking for window covering for your home, look no further than American Blinds and Shutters Outlet. We provide a wide array of window treatment products for homeowners across Sanford and central Florida. Our services range from custom design and ordering to delivery of all products and complete installation. No matter what type of window covering you’re looking for, we can find the right products for you. From shades to shutters, blinds, draperies, and even window film, we have it all. Check out our specialized products such as storm shutters, faux wood blinds, and polycore shutters. Go with the window covering experts today! Enhance your room environment today with brand new shutters in Sanford, FL from American Blinds and Shutters Outlet. Natural wood shutters offer sheer elegance with warm tones and earthy colors. 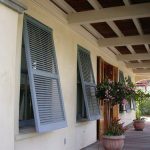 You can pick from shutters installed into your window’s framework, exterior shutters, or shutters that are installed inside the home. 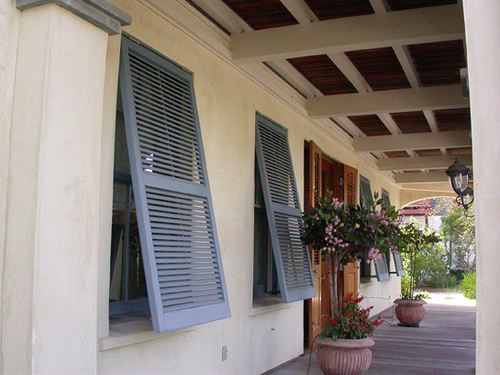 We carry louvered shutters, plantation shutters, raised panel and even shaker style shutters. Ask us about our wood composite shutters as well! For a completely different type of shutter, we suggest that you discover all the advantages of Polycore shutters. If you’re looking for an alternative to natural shutters in Sanford, then discover all the benefits of Polycore. Polycore shutters have the look and feel of real natural shutters, but are are made from more durable materials. There are several distinct benefits to Polycore. First, it doesn’t absorb moisture like natural wood. Second, it has a great solid finish that never needs to be re-applied. Simply clean the finish from time to time and it will always retain it’s beautiful appearance. Polycore shutters are easy to install into any room. You’ll love the reinforced metal core that keeps makes them extremely sturdy. Experience the beauty of natural blinds. Wood blinds are available in a variety of authentic tones with real wood grooves. Our wood blinds are built from the highest quality hardwoods anywhere in the industry. Wood blinds provide added insulation because of the thick wood construction. This also makes them a popular choice for ultimate privacy. And with their flexibility, they blend in well with all types of room environments regardless of whether you’re installing them in the kitchen, the bathroom, or the living room. Modern shades are come with numerous features that are designed to suit your exact specifications. Many of our most popular window coverings include pleated shades, solar shades, and woven wood shades. You can also choose from cellular shades, bamboo shades, roman shades, and exterior shades. All of our shade products are built with the highest quality construction from popular companies that you know and trust. Modern features include motorization, eco-friendly materials, moisture resistant, ultimate privacy, child-safe and so much more! If you want the perfect shades, then make American Blinds your number one choice! American Blinds and Shutters Outlet provides a variety of styles of shutters in Sanford. Call 407-492-1009 or complete our online request form to request a free estimate.